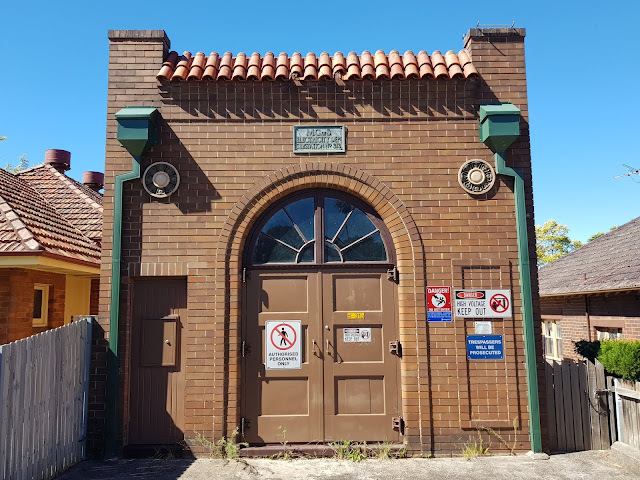 This electricity substation No.131 is located along Badminton Road, in the inner west suburb of Croydon. This heritage listed building was built in 1929 in the Interwar Georgian Revival style by the Municipal Council of Sydney. I like it. It's a step beyond pure utilitarian. People must listen to those signs. No lack of signs here. They have made it look pleasant rather than dull utilitarian! And it blends in well with the streetscape. What a fine looking little building in the Spanish style. This is a utility building with style. It's a shame it needs so many signs to warn people. It's kind of Steampunk. It looks like something out of the American West of the 1800s, but it has all those warning signs about electricity and such.